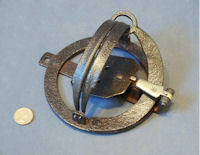 Original, quality late 19th century blacksmith made wrought iron 'D' shaped mammal trap set with an egg to trap foxes, crows and other predators. This good example has a strong leaf spring, 'D' shaped jaws and a brass catch and mount to take the egg bait. The catch is stamped "H. Lane Maker". All has been cleaned and lacquered and is complete and in good order. Hard to find these traps today. Base 8" diam and 4.5" tall not set. 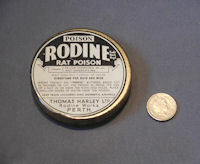 Original, quality, tin of pre-war rat poison. This small circular tin has a fully detailed lid with directions for use and for the maker Thomas Harley Ltd, Rodine Works, Perth". In good condition. 3" diameter x 0.75" front to back. 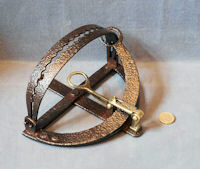 Original, quality, blacksmith made wrought iron and cast iron mole trap stamped "Anglo Impassable". 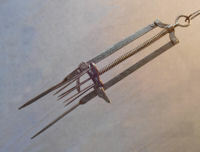 These traps, manufactured from 1888 to the 1940's, were very effective having a strong spring and sensitive trigger. This example has been cleaned and lacquered and is complete and in good order. 19" long x 6" and 5". Original, quality, late 19th century, blacksmith made wrought iron pole trap, as fixed to fence posts etc to trap the larger birds of prey. 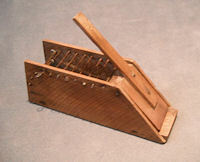 This example has smooth jaws and a brass tab to the catch and appears to have seen little use if any, thank goodness. These were made illegal to use in 1904 but are now very collectable. Complete and in good order. 5" jaws, base 5.5" diameter, total 7" widest and 3.5" tall. 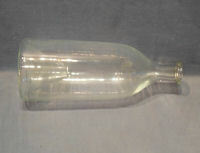 Original, quality, late 19th century, freeblown clear glass large 'bottle' minnow trap. The narrow end would be stuffed with a cork and the minnow would enter through the funnel base. Minnow were used for live bait to catch larger fish. The first we have seen of this size. Complete and in good and working order. 14.5" long x 5.5" diameter. 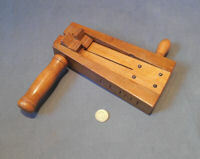 Original, quality, wooden 'Free Kirk' mouse trap in beech, circa 1900 / 1920's. The arm protruding from the end flap is set lightly under the bait hook wire, when the bait is disturbed the end flap is released and snaps down under the influence of the tension spring. No worm holes and in super condition, complete and in good and working order. 5.5" x 1.75" and 2" tall.